Taco Bell’s Nacho fries were the gift we didn’t know we needed. But Fire-sauce tortilla chips will be the gift we absolutely know we need. T. Bell announced it will launch a line of tortilla chips at retail stores in May; Mild and Fire flavors mirror the chain’s sauces, down to the design of the bags. The third flavor, Classic, is not based on a sauce and is just plain tortilla chips. That there is an unsauced chip but no Diablo chip is, in our opinion, a travesty. 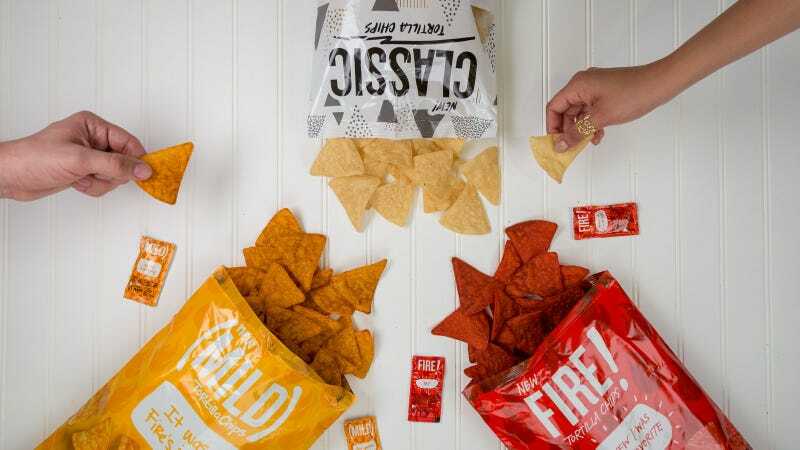 “Our sauce packets are one of the brand’s most unique aspects and were the natural choice for both the flavors and packaging of our tortilla chips,” Marisa Thalberg, Chief Brand Officer, Taco Bell Corp., said in a press release. Fire and Mild flavors will be sold in 1 ounce, 3.5 ounce, 11 ounce and 30 ounce bags, while the Classic chips will be solid in 1 ounce, 3.5 ounce, 13 ounce and 30 ounce bags. Taco Bell already sells taco sauce, cheese dip, and other branded products at Walmart; it’s unclear how widely these new tortilla chips will be available. But when they debut in May, you best believe we’ll pit that Fire sauce chip against Dorito’s Blaze in the name of science.